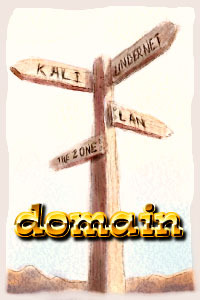 domain Where to get into a nasty gunfight. Because Outlaws uses a peer-to-peer networking model rather than th' more common Quake-style client-server model, anyone with a decent computer and internet connection can host an Outlaws match. Dedicated servers aren't needed, just players with relatively good connections to each other. To me th' peer-to-peer model offers much better gameplay than th' client-server model, but th' one "downside" ta not havin' dedicated servers is that many people don't know where ta go ta meet other Outlaws in battle. Of course ya kin also play Outlaws on a LAN. I did that once on the 3-person setup which wuz kinda fun although we only had the demo at the time. My advice? Go getcherself a buncha well-equipped friends, have 'em drag all their computers over ta yer place, hook 'em all up and invite me over. Thanks. GameSpy Arcade, a matchmaker program for peer-to-peer multiplayer games, advertizes support for Outlaws. I haven't used it and haven't heard much from those who have other than that the interface for finding people to play with is pretty snazzy. I used to host a multiplayer Outlaws session running continuously on a Outlaws-dedicated machine. You kin play multiplayer with either DirectPlay or regular Winsock drivers. Winsock is much less laggy. Lookin' fer a new way ta waste away that long weekend? How about hangin' out in two chat forums fer 14 hours an' loggin' th' conversations? Well that's what I did one fine Sunday, an' here are th' excitin' logs that reveal the true life of the Outlaws player. Kali offers my favorite interface fer playin' multiplayer Outlaws. It's full-featured an' fast -- only downside is th' $20 registration. You don't REALLY need ta register, but if ya spend a good deal of time in Kali you'll probably want to. These days, however, most rogue cowpokes opt fer th' free channels of IRC. Welcome to the wide and wacky world of Internet Relay Chat. There are thousands of lame channels out there, fortunately a few are home to dedicated Outlaws multiplayer fans. Meet, exchange files and set up games with fellow Outlaws fans all through a powerful and free interface. In their drive to rule the gaming world Microsoft struck a deal with Lucasarts to host LEC's games on Microsoft's Internet Gaming Zone. Outlaws was th' first ta make it in there an' because LEC's game documentation points ya there you'll find th' largest concentration of Outlaws in th' Zone. But th' Zone's crappy interface an' laggy multiplayer gaming tend ta drive th' more informed Outlaws elsewhere.